Matt Vuylsteke is a tried and true Oregonian who can’t shake his passion for wine. It may have been inevitable that winemaking found way into Matt’s heart; after all, it is literally in his blood. Back in the early 1900s, his great-grandfather was a winemaker in the Saint-Émilion region of Bordeaux. He was also influenced by his Aunt and Uncle who founded one of Oregon’s first wineries. Matt grew up in West Hills of Portland, just a stone’s throw from downtown. After graduating from Jesuit High School, he attended Oregon State where he discovered his love of winemaking. Matt’s first harvest dates back to 1997 when he had the privilege of learning the craft from legendary wine industry veteran Barney Watson at Tyee Wine Cellars. He graduated with a B.S. in Fermentation Science and Chemistry then went on to work with esteemed wineries in Oregon and Washington. Not one to remain idle, Matt decided to expand his scope of experience and transitioned to the supply side of the wine industry. Here he was able to hone his expertise in filtration, processing, and sales while concurrently completing his MBA degree and starting a consulting company with his wife and business partner, Nancy. Nancy Vuylsteke grew up in Southern Oregon within a food centric family where she never tired of Rogue River Salmon and Mom’s family recipes. Her interest in the intersection of food, science, and culture led her to Oregon State where she earned a B.S. in Nutrition & Foods. The next 13 years she spent working in product/culinary development and marketing for Pacific NW food companies. A perpetual learner, Nancy completed select professional culinary courses and her MBA while working full time. 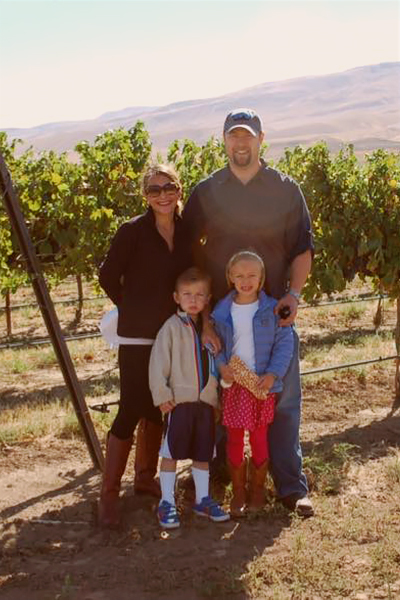 She and husband, Matt, have operated Farm to Cork, LLC since 2003, specializing in niche wine industry projects. Over the course of many years, she has learned the craft of winemaking hands-on from working harvests with Matt. The couple released their own wine label, 51Weeks Winemaking, in 2013, after much soul searching and planning. They would tell you that hands-down, their greatest adventure to date is that of parenthood to Irish twins...who just happen i.e. 51Weeks. Sign up to receive updates on wine releases and events. Thank you for your interest in Swede Hill Vineyards. We look forward to sharing news, event and wine updates with you.